Join our fabulous teacher Charlotte for six days and five nights of rejuvenating yoga, mountain walks, sea swims, glorious food and wine, beautiful views, chill time, and plenty of opportunities to feed the soul! Can’t choose between the mountains and the beach? With this retreat you don’t need to as you’ll spend time soaking up the natural beauty of both! Charlotte’s retreat takes place at El Cañuelo, a hamlet in the hills of Andalucía about an hour and a half away from Malaga. 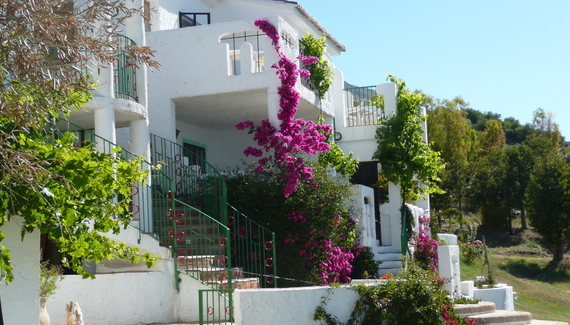 El Cañuelo is a cluster of casitas where you will be staying with incredible panoramic views across the hills and sea. There is a swimming pool, a choice of yoga terraces, a sauna, family run restaurant, and a bar for those of you wanting to enjoy a glass of something on your holiday! Enjoy fresh and delicious food at El Canuelo’s restaurant, with an à la carte menu which caters for all diets including vegetarian, vegan, fish and meat-eaters. One day you will hike through the hills and enjoy a home-cooked 3 course lunch at a country house. On the beach there is a restaurant that also serves good food. Charlotte has been teaching at The Yoga Edge since 2016 and now manages our two studios so you have probably seen her around! She teaches strong, flowing sequences and creates a nurturing space for students to challenge themselves as much or as little as they wish. Her calm teaching style and gentle, playful nature encourage students to find their own balance between yang and yin. Trained in Power Yoga, Rocket, Yin, Mindfulness, Forrest Yoga and about to embark on a Mandala Vinyasa and Shamanism course in Goa, Charlotte’s classes are always creative and infused with flavour! Always learning and exploring, she wants to share the healing benefits of yoga that she herself has experienced through each of these disciplines. *One day there is a trip to the beach, where you can practice yoga, eat, swim and hang out for the day. *One day there is a hike through the mountains and you’ll have a home-cooked 3 course lunch at a country house in the hills. £200 deposit required to secure your place. Payment plans are available on request. This retreat is independently run by our teacher Charlotte. For more information from Charlotte and to book her retreat, contact us here.